The nation’s premiere chamber choir, Voices New Zealand, performs Fauré’s tranquil Requiem by candlelight with Orchestra Wellington at the Wellington Cathedral of St. Paul. 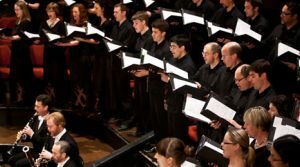 Fauré’s setting of the Requiem mass stands in stark contrast to its predecessors by Verdi and Mozart with its sweeping lyrical themes, and emphasis on comfort and peace to the living as much as the departed. Paired with the later Maurice Duruflé setting, the works are like two sides of the same coin, full of lush melody and harmony that evoke the later days of the Belle Epoque. Soprano Jane Tankersley, mezzo soprano Bianca Andrew, and baritone Christopher Hillier join Voices New Zealand and Orchestra Wellington in this performance directed by Karen Grylls.